Commander Rodgers was born in Washington, D.C. on 15 January 1881, son of Rear Admiral and Mrs. John A. (Perry) Rodgers. He was descended from a long line of distinguished Naval Officers, dating back to the Revolutionary War, his father being a retired Rear Admiral at the time of his son’s death. He was appointed, at large, to the Naval Academy in 1899 and graduated with the Class of 1903 on 2 February of that year. He was commissioned Ensign in February of 1905 after two years service afloat. After graduation in 1903 he had duty afloat in nine different ships and in 1909 he was Engineer Officer aboard the USS St. Louis his tenth tour of duty aboard a ship. In January of 1911 while Assistant to the Senior Engineer Officer aboard the USS Pennsylvania he was flown to a height of 400 feet in a Perkins man-carrying kite while the ship was underway in Santa Barbara Channel at 13 knots, remaining aloft for 15 minutes and making observations and taking pictures. Many years later Captain Zogbaum gave an account of Ely’s landing and takeoff from the USS Pennsylvania. Mr. Glenn Curtiss had already said that it would be feasible to land a flying machine on the deck of a ship. At this time Captain Zogbaum was Gunnery Officer and Commander Rodgers was his assistant. Neither of them had ever seen a flying machine, but they were ordered to make all the arrangements for this flight. The skipper of the USS Pennsylvania, a fiery little individual, Captain Pond, was rabid when he found out that his ship had been selected for this experiment which some Navy men favored. After pressure from Congress it was decided to have it take place on the USS Pennsylvania. The ship was ordered to Mare Island, California, where a platform was placed over the quarter deck to the chagrin of the Captain who wanted to know if it was necessary to mar the snowy planking of the quarterdeck. No one dreamed that the USS Pennsylvania so mutilated was the forerunner of the carriers of the future. Neither the Captain, the Executive Officer nor the Navigator would assume any part of the coming experiment. Captain Zogbaum and Commander Rodgers wondered who was going to take charge. Finally Captain Zogbaum was called to the Captain’s cabin and told that he was to make arrangements for this flight. He went to Commander Rodgers and told him he was going to need his help if he was willing. Captain Zogbaum said he couldn’t understand why the Gunnery Department was given this assignment. They decided to look up Mr. Ely who was participating in an Air Circus at a racetrack just outside of San Francisco. This they did and after having seen a few successful takeoffs and landings, they saw one plane lumber a few yards down the track, skid into a ditch and collapse. They were glad to learn that this plane was not flown by Ely or the one he planned to use for his attempt to land and takeoff from the USS Pennsylvania. After inquiries they located Mr. Ely. He seemed absolutely fearless with lion-hearted nerves. They claimed that this was the first time they had seen flying machines while Ely confessed that he had never seen an armored cruiser, although several months before he had not landed but had taken off successfully from the USS Birmingham. They invited Mr. Ely to visit the USS Pennsylvania the next day and have lunch aboard the ship. This he did and after inspecting the platform, the three of them went into a huddle, Ely making many suggestions as to how a track could be erected along the platform with timber boards in order to prevent him from crashing into the main mast and lines stretched across this track weighted down at each end with sand bags. Ely said he would arrange to have a hook fitted to the bottom of his plane to catch onto these lines in order to retard the speed of the plane. All this was done. Many distinguished guests were invited to witness this landing and takeoff from a ship. Everything went off magnificently and Captain Pond evidently made a right-around-face and was very proud of the fact that this first landing aboard a ship was made on the deck of his ship, theUSS Pennsylvania. Commander Rodgers was among the first group of Naval Officers to receive aviation instruction when in March of 1911 he was ordered to Dayton, Ohio, where he received aviation training from the Wright Brothers. By April of 1911 he soloed at the Wright School and was the first Wright School Navy pilot following Lieutenant (jg) Ellyson of the Curtiss School. He qualified as a pilot in August of 1911 under the regulations of the Federal Aeronautique Internationale, since the Navy at that time had not set up its own pilot qualification system. He was designated Naval Aviator No. 2 at the age of 30. By April of 1911 he was assigned to the Naval Academy where the pioneer officers in Naval Aviation were assembled into the first Naval Aviation Detachment and he was the senior officer present of this group. While there, he made the first cross-country flight made by a Naval Officer and one of the first flights made in the United States. One of the many mysteries surrounding Commander Rodgers was his whereabouts for about two weeks during the fall of 1911. The Navy Wright B-1 airplane log shows that he made a flight from Annapolis on 3 September 1911 for the flight to College Park with a series of flights from there to Baltimore, Havre de Grace and back to Annapolis. No dates were given for these flights then and there is a blank in the log until 14 November 1911. It was said that he flew away in the aircraft and was gone for two weeks during the middle of September, returning on the 17th of September. Commander Rodgers then went on leave and accompanied his cousin, Calbraith Perry Rodgers, on the first trans-continental flight made in America during the fall and winter of 1911 and 1912. There is much doubt as to how much he had to do with this flight. One source said he went along as a mechanic; another that he was Operations Officer. It is not known if he accompanied his cousin on the entire flight. It has been said that he put up half the money to buy the two planes from the Wright brothers, one of which was to be used as spare parts for the other. Some of this information, which is considered to be not entirely authentic and is very vague, was obtained from a Mr. Montgomery M. Green who now lives in the old Rodgers mansion at Havre de Grace and who is a relative of Commander Rodgers. Mr. Green appears to be a man of wealth and has a wife and two sons. Mr. Hipple, a handyman at the Rodgers’ estate at Havre de Grace, also gave some interesting information about Commander Rodgers. He said he was a dare-devil and seemed to have been very fond of him. He related that when Commander Rodgers was Assistant Chief of the Bureau of Aeronautics he flew to Havre de Grace on his way to Washington during a heavy snow storm intending to spend the night but, after checking the weather, he decided to go on to Aberdeen Proving Ground where the landing strip would be cleared of snow so he could continue his flight to Washington the next morning. 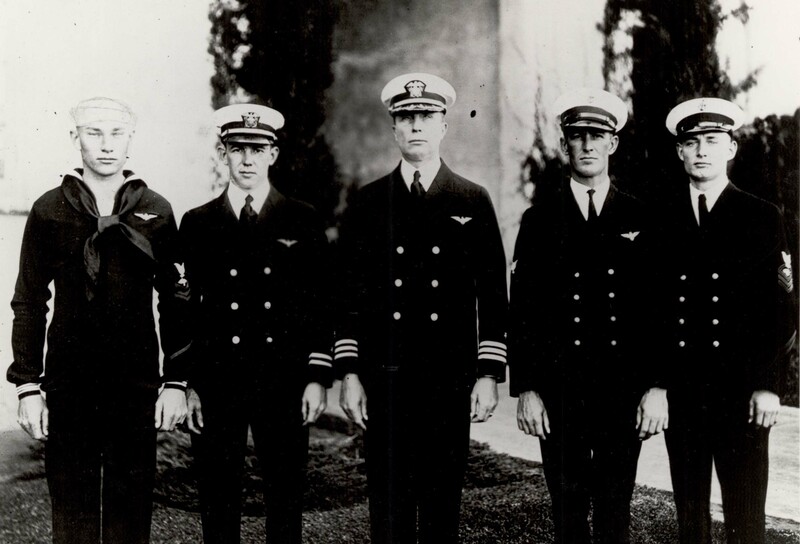 By January of 1912 he went to San Diego where, with other Naval aviators, he established a Naval Air Station. He was again senior officer of the group and while there conducted original, valuable and interesting experiments with seaplane floats. For this reason it may be said that he was a pioneer in placing aviation in the Navy at sea and with the Fleet. In May of 1912 he returned to Annapolis where he was still the senior officer among the Aviation Group and continued his work in connection with the development of Naval Aviation. He returned to general line duty in August of 1912 in command of the USS Yankton. However, he continued his interest in flying and made flights from the Naval Air Station, Pensacola, Florida. Later that year he joined the USS Illinois as Ordnance Officer and continued duty as Ordnance Officer aboard the USS Nebrasca and Executive Officer of the USS Paducah. In 1916 he was ordered to the USS Fulton for submarine training and the same year assumed command of Division One, Submarine Force, Atlantic Fleet, and Submarine C-3. After the United States entered World War I he had additional duty in command of the temporary submarine base at Coco Solo, C.Z., and later was commanding Officer of the Submarine Base, New London, Connecticut. In December of 1918 he assumed command of Division Ten, Submarine Force, Atlantic Fleet, and early in 1919 was assigned duty in command of Mine Sweeping Division No. One, Atlantic, and was awarded the Distinguished Service Medal for exceptional meritorious service in a duty of great responsibility. He briefly commanded the USS Black Hawk after which he served as Executive Officer of the USS Nevada. In 1921 he was ordered to the Navy Recruiting Station, Baltimore, Maryland, and was in charge until July of 1922. Returning to aviation duty he took command of the Naval Air Station, Pearl Harbor, Territory of Hawaii, where he remained until the completion of the joint Army-Navy maneuvers in that area in the spring of 1925. He then became Commander, Aircraft Squadrons, Battle Fleet, his pennant in the USS Rhode Island and later in the USS Langley. He was Commanding Officer of the PN-9 No. 1, which on 31 August 1925 took off from San Pablo Bay near San Francisco on the first flight to Hawaii non stop. His plane was forced to land at sea nearly 2,000 miles from the point of departure due to lack of fuel and as the radio set was out of commission no word was received from this plane as it landed. When no word was received a search was immediately started by all available ships including a squadron of destroyers returning from a New Zealand cruise. Commander Rodgers being unable to send out messages and failing to see any of the searching ships made his way toward land using material from the wings of the plane as sails. He was always said to be a dare devil and most resourceful. They had taken with them food and water to last for three days and were not found for ten days, at which time they were practically out of food and with only such water which was caught during rain squalls and the little that was made by a small still which Commander Rodgers had reluctantly accepted from his mother prior to his departure on this flight. During these ten days he succeeded in keeping the morale of his crew in the highest state and successfully sailed the plane to within 15 miles of Nawiliwili Bay, Kauai, where it was found and picked up by the submarine R-4 and towed into port. In January of 1926 Commander Rodgers assumed the duties of Assistant Chief of the Bureau of Aeronautics at the age of 45. Commander Rodgers had often been called a man of mystery as so little is known about his personality and relationships with others. Even Gertrude Baker, Admiral Moffett’s secretary said he was hard to get acquainted with. Also, he seems to have been a man of many faces as the few photographs which have been located scarcely bear any resemblance to each other. One, evidently taken during the time he was Assistant Chief of the Bureau of Aeronautics, is that of a not too handsome man with a rather stupid, bull-doggish expression on his face. Another, although taken while he was a Commander, looks like that of an esthetic, handsome, with keen intelligent eyes, well shaped nose and a firm, well shaped though large mouth. One taken just before or after the eventful flight in the PN-9 to Hawaii bears not the slightest resemblance to the other two. In this picture he is smiling and has a gay, debonair, devil-may-care expression on his face. 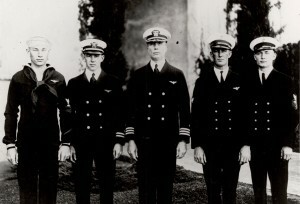 In this picture it shows that he must have been a very tall man as he towers over the others in the group and his face looks long and narrow while in the other two rather round. There was also some question as to whether he had one or two brothers. An older brother was lost in Alaska in 1910. A younger brother, a noted architect died after their father, Admiral Rodgers died, but his name was not mentioned in the obituary notice. When the younger son, Robert, died the same ancestors were mentioned. There is some doubt as to whether he was Commander Rodgers’ brother or a cousin, or had been disowned by Admiral Rodgers. Commander Rodgers had been married and divorced before he became Assistant Chief of the Bureau of Aeronautics and had one daughter, Helen Perry Rodgers who, some years after her father’s death, married a Frenchman, is now a widow and is residing permanently in France. She and her young son are Commander Rodgers’ only descendents. Commander Rodgers’ tour of duty in the Bureau of Aeronautics as Assistant Chief was very brief, just seven months, as he died on 27 August 1926 from injuries received in an airplane crash two or three days after the accident occurred at League Island, Pennsylvania. This, the summer of 1926 was a black one for the Bureau of Aeronautics, as one third of the officers assigned to this Bureau were killed in separate crashes. In addition to the Distinguished Service Medal, Commander Rodgers was awarded the Spanish Campaign Medal, the Mexican Service Medal and the Victory Medal (World War I), Submarine Clasp. Before her marriage Helen Perry Rodgers (now Mrs. Rauol-Duval) was sponsor at the launching in May of 1942 of the destroyer USS John Rodgers honoring Commander Rodgers, his great uncle and great grandfather of the same name.